ISTANBUL — Summer is coming and it is getting hotter every passing day. Probably, you are sweating more compared to the wintertime, so you are supposed to drink eight to nine glasses of water per day to prevent dehydration. But water is not the only way to quench your thirst. You can replace it with various beverages, water-rich desserts and foods. Every nation and culture has its own drinks and foods to quench thirst. For instance, Italians prefer to drink affogato, a smooth ice cream drowning in a cup of espresso, while Japanese people enjoy kakigori, a shaved ice dessert flavored with syrup and condensed milk. When it comes to Turkey, ayran is on top of the summertime beverages list, followed by cacık and haydari. Ayran, which is also known as the non-alcoholic national drink of Turkey, is made of yogurt, water and salt. It is very easy to make this drink on your own by mixing all the ingredients mentioned above, according to your own taste and desired thickness. In addition to thirst quenching, it is also very healthy. It does not contain sugar. Drinking salty ayran is one of the few rapid ways to intake sodium (salt) during summer months when one can dehydrate and lose salt, which can prove dangerous to one's health. In addition one can benefit from the undeniable health benefits of yoghurt, which is high in protein and calcium. Ayran is one of the fundamental drinks of Turkish culture dating back to Central Asia. The Gokturks are thought to have first developed ayran thousands of years ago by diluting bitter yoghurt with water to improve its flavor. The popularity of this drink has spread to other parts of the world from Turkey. Today, ayran is omnipresent across Turkey, offered almost everywhere that serves drinks, including foreign fast-food chains such as Mc-Donald's and Burger King. In addition to Turkey, ayran is found in Iran, Iraq, Afghanistan, the Balkans, Lebanon, Azerbaijan, Armenia, Kyrgyzstan and across the Caucasus. This drink has various names in these regions. 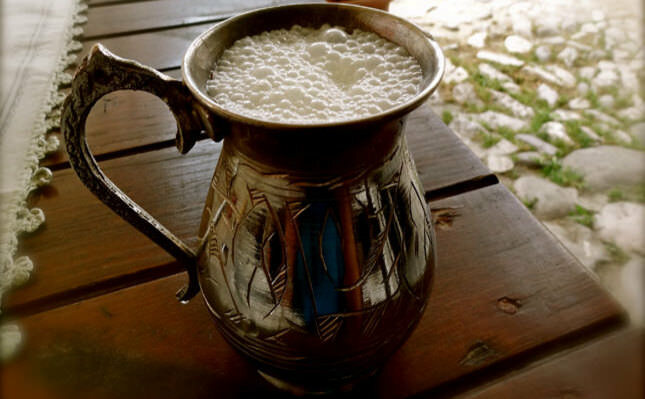 In Albanian cuisine, ayran is referred to as "dhalle," "than" in Armenian, "ayryan" in Bulgarian and "ariani" in Greek. The small town of Susurluk in Balıkesir Province in northwestern Turkey is well known for its ayran, which characteristically has a foamy head and creamy taste. The ingredients are pretty much the same as normal ayran but, restaurants in Susurluk use high-speed pumps to circulate ayran through a faucet so as to create a foamy texture with a heavy creamy top along with a lower salt content than in normal ayran. Since ayran is a summer drink, it is usually served chilled as an appetizer. It goes quite well with doners, pastries and kebabs as well as main course dishes. Various street foods and fast foods can be eaten with ayran. You can drink ayran plain or add mint. Simply, if you dilute yoghurt with less water and add cucumber pieces to it, you will have another dish: cacık, which is made of yoghurt, salt, olive oil, crushed garlic, chopped cucumber and mint. Cacık is mostly served to accompany grilled meats, and it can be consumed as a mezze alongside other dishes. As a side dish, it is diluted heavily with water, which results in a soup-like consistency. It has different versions in different countries. Cacık is known as tzatziki in Greek cuisine, tarator in Balkan cuisine and jajeek in Iraq. Haydari is a different type of mixture of some herbs, spices and garlic with strained yoghurt. The main difference from cacık is that cucumber is not included in the recipe. It is only served as a mezze and it is supposed to have a more sour and saltier flavor than cacık. If you want to taste cacık and haydari, you should sit in a restaurant and order them together with your main course dishes. However, you don't need a restaurant to taste ayran. Many vendors in touristic areas of Istanbul will be more than willing to fill a cup of ayran from the containers on their back to refresh yourself before getting on your way.